Seattle’s new streetcar route, the First Hill line, finally opened on Saturday. Despite the cold and rain, months of tantalizingly empty test runs and the promise of free rides drew large crowds along the entire route. The new line runs from Pioneer Square and the International District on Jackson Street, through the Yesler Terrace public housing development via 14th Avenue E and E Yesler Way, and on First Hill and Capitol Hill via Broadway. 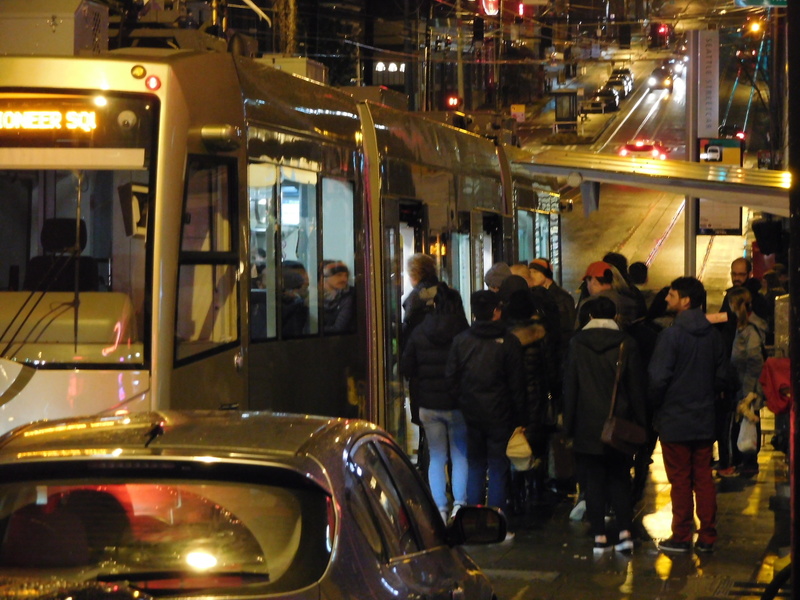 Though over a year late due to manufacturing problems, and designed less robustly than it could have been, the line adds a new transportation link for Central Seattle and provides lessons for how future streetcar lines should be designed elsewhere. In the early 20th century, Seattle had an extensive streetcar network like most other major U.S. cities, but it was eventually dismantled in 1941 due to financial struggles and growing competition from automobiles. The only resurgence was a 1.6-mile historic streetcar line that operated on the Seattle waterfront from 1982 until 2005, when its maintenance shed was replaced by the Olympic Sculpture Park. But, inspired by the success of Portland’s modern streetcar comeback in 2001, Seattle opened the 1.3-mile South Lake Union (SlU) line in 2007. 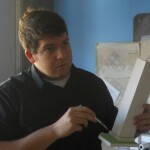 It was aligned with planned office and residential growth in the now-booming SLU area that is home to Amazon.com. Average weekday ridership is 2,600 passengers. The SLU line currently operates in mixed traffic but work on Westlake Avenue is underway to give the streetcar and co-aligned bus routes higher traffic priority. Nearly a decade later, the First Hill line is now coming online to serve neighborhoods on the eastern side of the Central City. 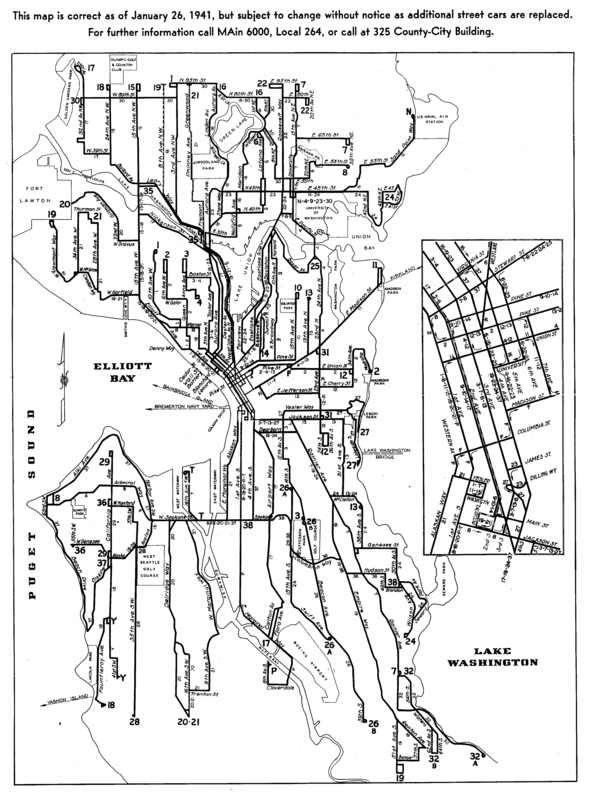 Historic Seattle streetcar map, circa 1941. The new line was designed as compensation for the residents and businesses of First Hill during the planning of Sound Transit’s University Link light rail extension. First Hill is home to both large apartment towers and major employers, including multiple hospitals and Seattle University, making it one of Seattle’s original dense, walkable, and transit-dependent neighborhoods. However, the proposed station would have been deep underground. In 2005, uncertainties in soil conditions and costs led the agency to recommend skipping First Hill on the way to Capitol Hill from Downtown, a move that many residents are still unhappy with. 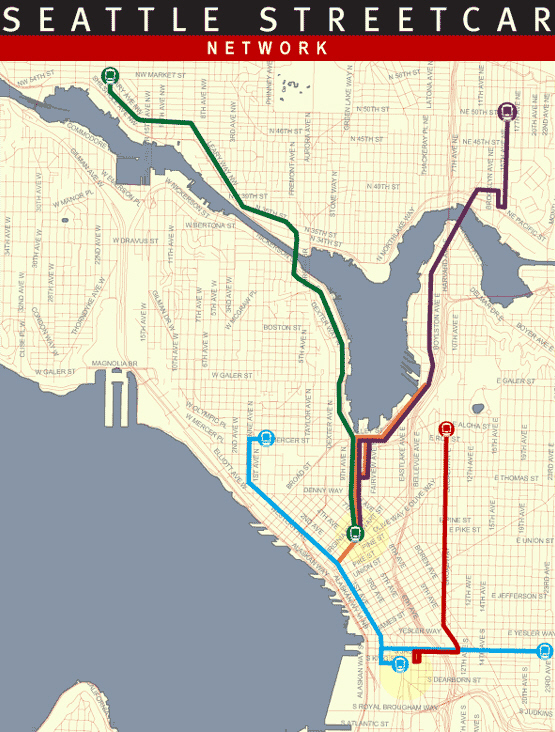 The First Hill streetcar mitigates the cancelled light rail station by connecting to two other stations, shown in the map below. At Broadway and E Denny Way, the line’s northern terminus is directly adjacent to an entry for Capitol Hill Station, which is opening in March. The second-to-last stop at the other end is near both the King Street Amtrak/Sounder station and the International District bus and light rail station at Fifth Avenue and Jackson Street. It’s a new connection for First Hill residents, employees, and visitors that doesn’t replicate any existing bus routes. It also complements the high intensity of pedestrian-scale retail and entertainment on Broadway that include bars, restaurants, theaters, and small shops of all kinds. With a second Downtown tunnel now on the planning boards, some transit advocates have proposed the next round of light rail include a First Hill stop after all. Another transportation project that is coming to the neighborhood is bus rapid transit (BRT) on Madison Street. The First Hill streetcar mostly shares the roadway with general traffic on a 2.5 -mile, ten-station route. It cost approximately $134 million and was almost entirely funded by Sound Transit through the ST2 tax package. Fares will start at $2.50 for adults and the system will accept ORCA cards. On weekdays it will run every ten minutes during peak periods (6-9am and 4-6pm), every 12 minutes during midday (9am-4pm), and as low as every 18-25 minutes early in the morning and late at night. Average weekday ridership is expected to be between 3,000 and 3,500. The opening’s announcement from the Seattle Department of Transportation (SDOT) was released only one day before, extremely short notice for a project of this type. Despite the limited media coverage, the word spread quickly and my first ride was standing room only from one end of the line to the other. The big crowds exhibited subdued excitement, but we got a love of waves and smiles from people on the sidewalks as the streetcar rolled by. The stations and roadway design are quite an upgrade from typical transit streets. Each streetcar stop has a shelter with a glass canopy and a large map, schedule information, and a real-time information sign that shows the expected arrival times for the next two trains. The complete rebuild of Broadway allowed for new sidewalks, elaborate new plantings, and the installation of one of the highest quality bicycle facilities in Seattle. The two-way protected bike lane provides an easy north-south route that is protected by a mix of concrete, plastic bollards, and parked cars. It also has its own traffic lights at major intersections. As with the SLU line, the streetcar was much easier to board than a standard bus; I compared it to my experience on the route 49’s busy Broadway segment. With three doors on each side, level floors, and off-board fare payment in the future, dwell times were as short as 15-20 seconds even with large passenger flows, people in wheelchairs, and bicyclists. The ride was smooth and one passenger even commented she didn’t need to hold on. The long distance between the Broadway stops made the trip feel somewhat fast, and overall the trip from Capitol Hill to Pioneer Square was a reasonable 20 minutes, but this was during the middle of the day on a Saturday when traffic is light. The streetcar was particularly slow at the three 90-degree bends on the Yesler Way and 14th Avenue segments, turns that a bus operator could have made much more quickly. A faster and shorter design would have used Boren Avenue and 12th Avenue. I was a little befuddled by the change in stop placement. In Capitol Hill and Yesler Terrace the stops are conveniently located on the curb. On five-lane Jackson Street they are located in the center of the street, where the streetcar runs on the inside lanes. Jackson Street also has bus lines that use right-side bus stops, so there is a missed opportunity for shared infrastructure. Additionally, the center stations require passengers to cross two lanes of traffic or wait for a pedestrian signal no matter which direction they’re walking to and from. 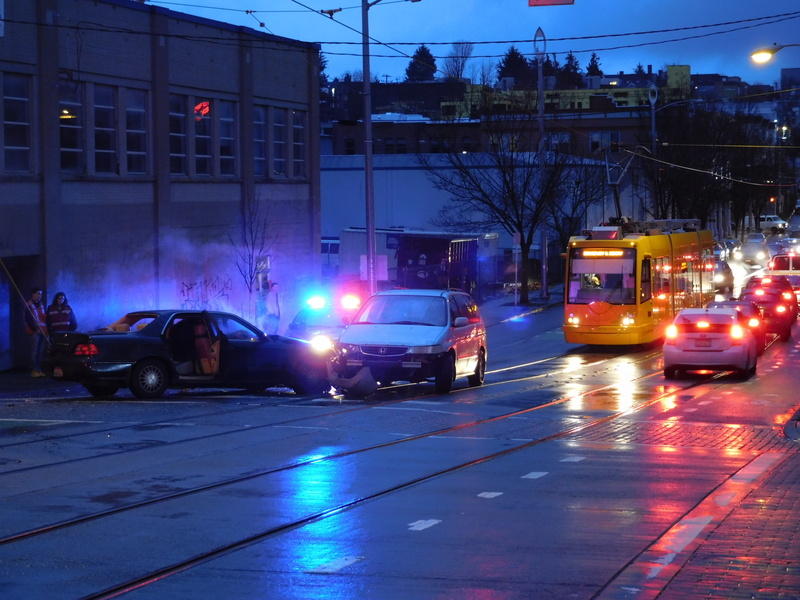 On my return trip, the streetcar was blocked by a car crash at Yesler Way and 12th Avenue, next to Bailey Gatzert Elementary School. The driver announced the tracks were blocked, and after a few minutes she let passengers off when it became obvious we would not be moving for a while. I followed the tracks back to Capitol Hill, sat down for a drink at a bar on Broadway, and it wasn’t until an hour later that I saw the same yellow streetcar finally glide by. Some of the audio issues were minor aggravations. The streetcar interiors have dynamic screens that show the name of the next several stops, but the computerized audio announcements are a little too loud and awkwardly pronounced. Especially for fixed transit like rail, it’s curious why transit agencies don’t simply use human recordings for stop alerts. Another audio issue was the high-pitched beeping when the doors are closing; in some cases, the beeping continued long after the doors had closed and exterior wheelchair ramps were being retracted, an unnecessary warning for interior passengers. I also had an issue with wayfinding. The line is not yet available on popular applications like OneBusAway and Transit App, only a browser-based service called NextBus that is linked from the Seattle Streetcar website. It’s neat in that it shows the location of transit vehicles, but NextBus has a couple of glaring errors. First, it’s missing the end of the line in Pioneer Square and doesn’t show the last stop at Occidental Avenue. Secondly, it incorrectly shows a pair of stops at Union Street. When I waited for a northbound streetcar at what appeared to be to be the Union Street stop, the streetcar blew by. It turns out that I was actually waiting at a bus stop that, at first glance, appeared to be a streetcar stop. The long wait at some traffic lights revealed that the First Hill streetcar has virtually notransit signal priority (TSP). TSP is an add-on to traffic light systems that detects when transit vehicles are nearby, and either provides a longer green light or a shorter red light to help them get through faster. It is an advertised feature of King County Metro’s RapidRide routes and is in place on a number of Downtown Seattle streets for other local buses. In the absence of exclusive lanes, TSP could help the streetcar move faster. This is important because the biggest issue that transit experts and advocates have with streetcars is that get stuck in traffic. The most popular explanation for this is the lack of exclusive lanes, so the argument is that streetcars should not be built without their own lanes. At first brush this is odd, because streetcars are conceptually only supposed to provide the same service as local buses (stops every quarter mile, 10-15 minute frequency during peak) but with higher passenger capacity and ease of boarding. The vast majority of local bus routes do not enjoy transit-only lanes, so why would it be expected that streetcars do? I have an unscientific three-point theory to explain why transit wonks feel this way. Firstly, practically every other form of rail transit operates in dedicated right-of-way: freight trains, Amtrak, commuter rail, heavy rail and subways, and light rail typically have priority over automobiles, creating a physiological expectation that streetcars do not meet. Secondly, streetcars are helpless when an obstacle blocks the tracks whereas a bus could usually go around, leading to the conclusion that streetcars need some kind of priority treatment. Thirdly, the higher capital expense of streetcar routes (which includes rail, concrete foundations, stations, utility relocations, and signals) seems to justify higher reliability. The second response is to provide exclusive lanes. Related improvements include turning restrictions and limiting on-street parking. For buses, exclusive lanes are achieved through signage and paint on the roadway, but they’re difficult to enforce and wouldn’t prevent obstructions from delaying a streetcar. The more reliable solution would be a more costly raised trackway, like for Link light rail on Martin Luther King Jr. Way in south Seattle. Either presents a high political barrier because motorists often see exclusive lanes as taking away space for general lanes and on-street parking. SDOT has acknowledged this theory and the response in two ways. First, the SLU line, along with King County Metro route 40 and the RapidRide C line, will soon benefit from transit-only lanes, restricted turning movements, and removal of on-street parking at various points along Westlake Avenue. According to SDOT’s project page, the changes are due for completion by March 26th. Last year, I included the above table about the SLU line’s operations in another streetcar post. I have a request in for the rest of the 2014 and 2015 data, but apparently the numbers are high enough to justify dedicated lanes nine years after the SLU streetcar opened. The SLU line is typically blocked by crashed vehicles once a month or less. Other incidents like incorrectly parked cars and trucks and emergency response vehicles make up the bulk of blocking incidents, but they too are much less frequent than simple traffic congestion. The second acknowledgement is that SDOT is designing dedicated lanes into the Center City Connector (CCC). Planned to open in 2018, the CCC will connect the SLU and First Hill lines via streetcar-only lanes on First Avenue and Stewart Street in the Downtown core. First Avenue has weekday average of 21,200 vehicles on an asymmetrical street that has three lanes northbound, two lanes southbound, variable peak-hour parking restrictions, and no turn lanes. The larger traffic volume, right-of-way width, and opportunity to simplify the street layout helped justify planners’ choice to run the Center City Connector in exclusive lanes. These retroactive and proactive changes for improving streetcar reliability raise important questions. Has the First Hill line also been inadequately planned? Will the City need to upgrade it too in a decade at significant expense? And is it actually possible to “fix” the First Hill line anyway? Let’s combine the first two questions. The answer depends on observing at least a year or two of operations and seeing how well the streetcar’s reliability holds up in traffic. Broadway and Jackson Street traffic volumes are respectively 13,700 and 15,300 vehicles per average weekday, which is not in itself significant but also not a reliable predictor of congestion impacts. Anecdotally, Broadway and Jackson Street rarely experience the significant congestion that is familiar on other Seattle arterials. Broadway does have many on-street parking spaces next to the tracks, but it also has many left- and right-turn lanes that keep turning cars out of the way. This leads into the answer for the third and final question. 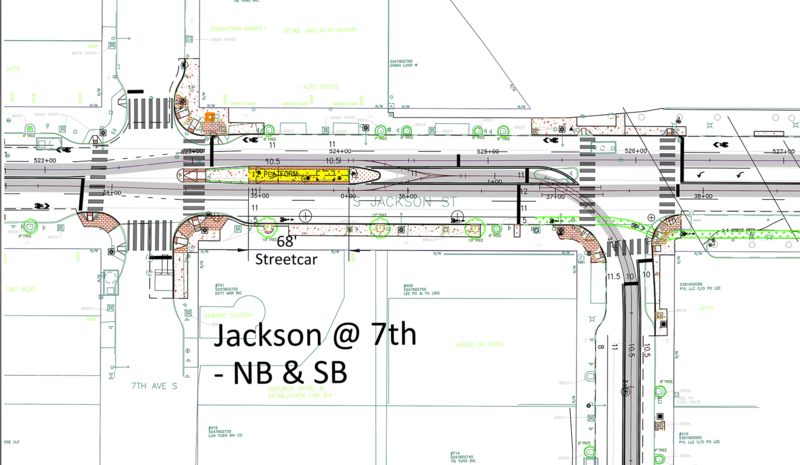 To start with, it is absolutely possible to redesign Jackson Street to have an exclusive transit lane for both streetcars and buses, but the streetcar tracks and stations would need to be demolished and relocated to the outsides of the roadway. This would leave two general purpose lanes and a center turn lane for automobiles, which is plenty of capacity for the traffic volume that Jackson Street carries; SDOT has done numerous other street rechannelizations that have shown this to be the case. Jackson Street also has discontinuous bicycle facilities that have already led to at least one serious injury. The 14th Avenue and Yesler Way segments are too short and low-traffic to consider major changes. And in fact the streetcar does have three blocks of exclusive lane southbound on 14th Avenue already. But several stops in the area could be consolidated to speed up the route. On Jackson Avenue the Fifth Avenue and Seventh Avenue stations are only three blocks or 900 feet apart (quarter-mile spacing equates to 1,300 feet). And the 12th Avenue stop is only 900 linear feet from the 14th Avenue stop at Washington Street. In order to preserve the transit connections offered by the 5th Avenue stop, I’d suggest consolidating the 7th Avenue and 12th Avenue stops at 10th Avenue, which is still near residences and commercial buildings. The recently rebuilt Broadway is a goulash of separated bicycle lanes, driveways, left- and right-turn car lanes, driveways, parallel-parking spots and streetcar tracks running in the general traffic lanes. “I’m not sure that if it had happened under my watch, we would have put all those things in one place,” said Murray, a longtime Capitol Hill resident and former state legislator. In hindsight, the parallel 12th Avenue might have been designed as the haven for bicycling, he said. Some scenarios even favored placing the rails on 12th. Broadway’s right-of-way is consistently 80 feet with a roadway width (curb to curb) of 52 to 54 feet. With the two-way protected bike lane on the east side there is no room for exclusive streetcar lanes without removing all parking and turning lanes, something that would face fierce resistance from local retailers, motorists, and transportation engineers. It would also require the removal of either the three northbound stations that are “floating” next to the bike lane or the removal of the bike lane itself, neither of which are a practical multi-modal solution. I agree with Mayor Murray, though perhaps not in the way he would expect: maybe not all streets need to support cars. Or at least, parked cars. Removing parallel parking and closing the plethora of driveways on Broadway would help to make the street more readable, safer, and easier to use for all modes. It wouldn’t provide space for exclusive streetcar lanes, but it would preserve the center left-turn lanes, enable to the tracks to be straightened, and create extra space for things like landscaping and furniture on a street that is already dominated by foot traffic. In fact, Broadway is a prime candidate for being closed to general traffic and being restricted to pedestrians, bicyclists, transit, and deliveries; this would make the most sense between Roy Street and Madison Street. Extremely few residents drive to businesses on Broadway; a 2011 travel survey found that only 8 percent of Capitol Hill residents do so, while 67 percent walk. Delivery trucks often park in the center turn lane where it exists, and there are alleyways and plenty of side streets, so there would be no loss of loading space. This idea will be explored in a future post. So, beyond the long term changes discussed above, the best that transit advocates can hope for on Broadway is implementation of transit signal priority at all intersections. That’s a short term solution that can be implemented today for relatively low cost, but even that should be held off until the reliability of the First Hill streetcar is properly assessed. The First Hill line is already planned for a 0.5-mile northbound extension with stops at Harrison Street and Roy Street. Despite Mayor Murray’s sentiment, the site plan (PDF)show a continuation of Broadway’s two-way protected bike lane and the weaving hodgepodge of turn lanes and on-street parking, but with more turning restrictions on cars. About half of the $24 million cost (PDF) will come from federal funds. Construction is expected to begin in 2017 and the segment is expected to add 1,000 riders per day by 2030. As a side note, I once had an idea in an earlier post to extend the route much further north to Eastlake and the University District. It’s unrealistic because the northern part of Capitol Hill simply doesn’t have the residential density, commercial attractions, and job centers to justify the investment. Plus, new light rail service will attract much of the ridership between Capitol Hill the U-District, meaning the hypothetical extension would perform lower than the route 49 it would replace. 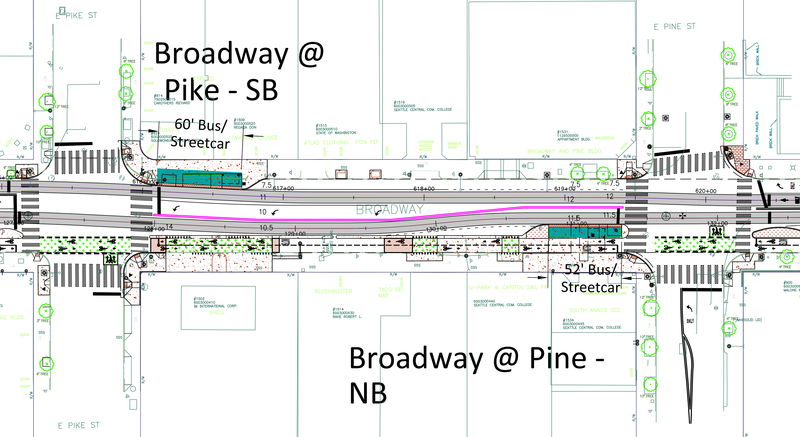 There are no other plans for streetcars beyond the Broadway extension and the Center City Connector. 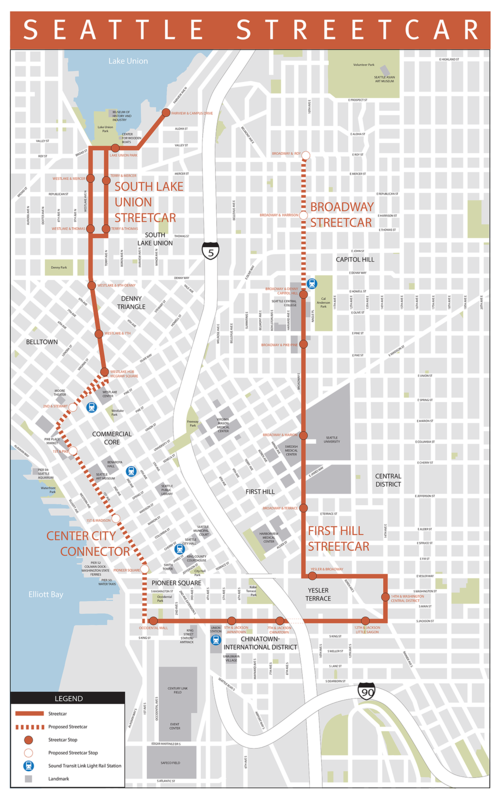 At one time a 2008 streetcar plan envisioned lines from Downtown to the University District and Ballard. But more recent studies are looking at BRT on Eastlake Avenue and light rail to Ballard for enhancing some of those high-demand corridors. The extensions to the Central District and Uptown, shown in blue in the map below, are not on the City’s radar either. 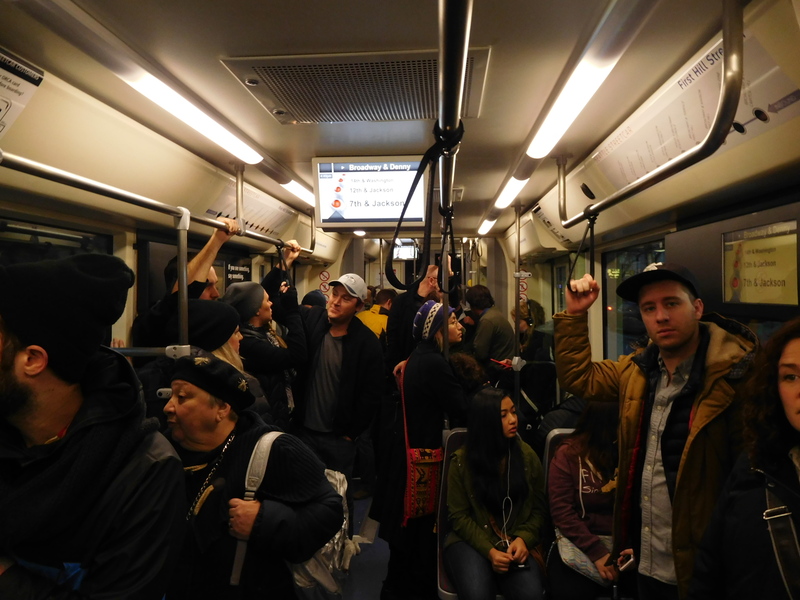 The lessons from this post mostly concern redesigns of the First Hill line in the long term. As The Seattle Times noted, “…both Murray and SDOT director Scott Kubly say they’re not inclined to tear up brand-new facilities.” It won’t be until 10 or 20 years from now that Broadway could be revisited with a more streamlined vision. In the short term, as mentioned, a pedestrian-transit mall might be more feasible. There are also lessons for streetcar advocates and transportation planners in other cities. The key takeaway is that exclusive lanes are not absolutely necessary. Broader considerations of a street’s purpose, right-of-way width, mode share, adjacent land uses, and the purpose of rail transit need to be evaluated. Transit signal priority can significantly speed up streetcars without the higher investment in exclusive lanes. However, the case for exclusive lanes can be made easier if streetcars are routed on wider streets like Seattle’s Westlake, First, and Jackson Street and if the lanes can be shared with bus routes. It’s been 15 years since Portland started the streetcar revival, and since then other cities like Washington, D.C., Atlanta, GA, Dallas, TX, and Charlotte, NC have built modern streetcars. Streetcars offer a unique experience that have often been linked to tourism and economic development, but they should foremost be used as tools for high-quality transportation. Build transit that moves people to where they want to go, quickly and in comfort, and you’ve done something right regardless of which mode is chosen or how its integrated into vibrant urban neighborhoods. It’s South Jackson Street, not Avenue. Interesting that you went from consistently saying “Jackson Street” above the “critique” heading to “Jackson Avenue” below the “critique” heading. It makes me think you aren’t that familiar with Seattle’s street layout. Streets go east/west, avenues go north/south. Maybe you’re a recent transplant? I rarely see people that have been here for years get them mixed up. Wow, the very first day of operation and we have a great example of why streetcars don’t make sense. Unless you can completely cut them off from traffic, all it takes is one accident to shut them down. A bus (whether a regular bus or a BRT) would easily get around that mess. I’ve seen the same thing in Toronto (and their streetcars actually make sense because they are much bigger than our buses and they have existed for years). The other reason that streetcars make little sense in this town is because we have very steep hills. The route a streetcar can take is therefore limited. For example, if this was a BRT route, then it could easily use Yesler, thus saving riders a considerable amount of time. That would, in turn, mean running it a lot more often (at no additional cost). But like many possible routes, it is just too steep for a streetcar. I think it’s important context that this isn’t necessarily “a planning failure” as some would like to cast it now. The community was very clear in the early planning stages for this project that they wouldn’t support exclusive lanes, wanted to maintain parking/loading for businesses, etc. Whether or not City planners could have done a better job of educating or persuading the public may be a matter for debate, but the planners certainly pointed out the options in community meetings at the time. I would still consider that a planning failure in the greater sense of the word. Or maybe a political failure. At some point, someone should have said “this won’t work”. Just like you can’t build a monorail from Ballard to West Seattle for a couple billion dollars. We might want one, but it doesn’t make sense. That is why we have a representative democracy. Public input is a great idea, but you shouldn’t build something silly (like this) even if the folks that bother to show up at meetings say they want it. This shouldn’t have been a streetcar, and it shouldn’t have followed such a ridiculous zig-zag route. This sits in great contrast to Madison BRT, which will be much faster and much more direct (and much more frequent as a result). If the monorail had been built, you might currently have a grade-separated rapid transit system carrying thousands of people from Ballard to Downtown in around like 18 minutes. Seems to me that this would have satisfied many people now living there, don’t you think? Meanwhile, we’re spending more than that for a waterfront tunnel that has literally experienced just about every “crazy” and “unlikely” worst case scenario suggested by opponents and is long overdue. And we STILL haven’t planned for how to accommodate the change in traffic patterns after it opens. THERE is your example of a planning failure — which a majority of voters supported. If the monorail had been built, and the magic ponies would have been here as promised, then things would have been great. But alas, it was never to be. Look, I hate to break it to you, but the monorail project was ridiculous. It was never going to happen. Even if they didn’t screw up with the taxing, it was bound to have cost overruns that make Bertha look wonderful. They would have been similar to the Big Dig, but without the political will to finish. Here is an assessment from a man who once ran an organization that suggested we can afford 2 different light rail lines to Everett and Tacoma — http://seattletransitblog.com/2008/03/19/a-rehash-what-was-wrong-with-the-monorail/#comment-2272. Just to be clear, I don’t support the SR 99 tunnel and I voted for the monorail project every time. But I was duped, like so many others, into thinking it could be built at roughly the cost they said. The SR 99 tunnel, meanwhile, was a stupid idea even if it somehow magically managed to be delivered on time and under budget (the first of which is now impossible and the second unlikely). I happen to think there would have been a financial problem when the Big Recession hit… but the project itself was just fine. It was reviewed by top experts from around the world. And there was a consortium ready with a $2 billion contract to be signed by the City. Despite what ultimately happened to the project, it wasn’t a trick pony like some Simpsons song. The Project was killed by various powerful people/groups who didn’t want to see it built. Of course we’re moving on, but it’s yet one more failure on the road that drives us all nuts that we shouldn’t be waiting 10 or 20 years for a transit system, we should have had it 10 or 20 years ago (or 30 or 40).